Last evening, thanks to Fred Brill, Meat Manager, par excellence at Adam’s FairAcre Market we grilled a great 1-3/4″ Veal Rib Chop. It was seasoned with Salt and Pepper, then Sage leaves and EVOO were whirled in a small food processor to form a Pesto, that was brushed on both sides. 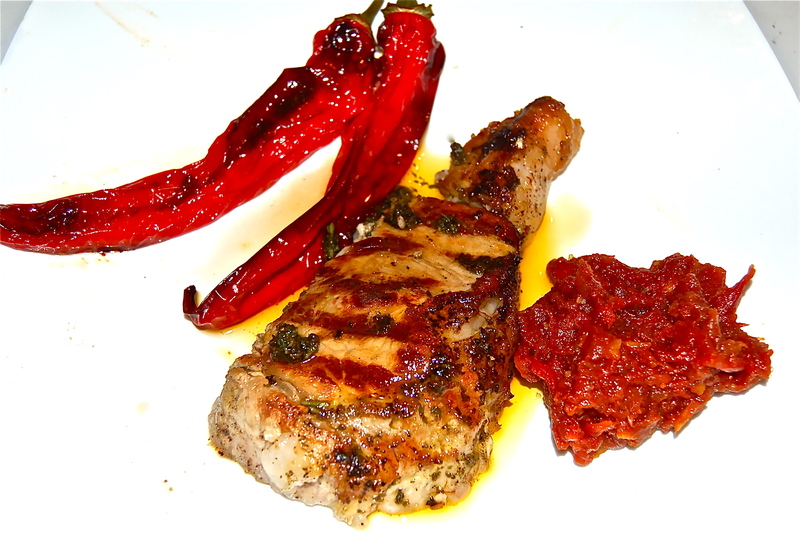 The Veal Chop was accompained by Tomato Jam and oven roasted Sweet Italian Peppers. 2. Heat the oven to 400 degrees, & heat a grill Pan on the stove over medium high heat. Add the Veal Chop to the pan & grill each side for 2-1/2minutes, weighed down with a meat press. Remove the grill pan with the Veal Chop from the heat & set aside. 3. 15 minutes before serving time, place the grill pan in the oven, & roast for about 8 to 10 minutes. Check occasionally with an instant thermometer. When the Veal Chop reaches 115 to 118 degrees, remove & allow to resettle. While resting, it will add a couple of degrees. 4. In the heated 400 degree oven, place the Italian Peppers on a sheet pan, douse with EVOO & roast for 15 to 20 minutes until charred & tender. 5. At serving time, cut the Veal Chop horizontally down the center into two serving slices & proceed with the plating. The Tomato Jam adds great flavor. Jalapeño or other Pepper, stemmed, seeded & minced, or Red Pepper Flakes or Cayenne to taste. 1. Combine all the ingredients in a heavy medium saucepan, Bring to a boil over medium heat, stirring often. 2. Reduce the heat & simmer, stirring occasionally, until mixture has the consistency of thick jam, about 1 hour 15 minutes. Taste & adjust seasoning, then cool & refrigerate until ready to use.